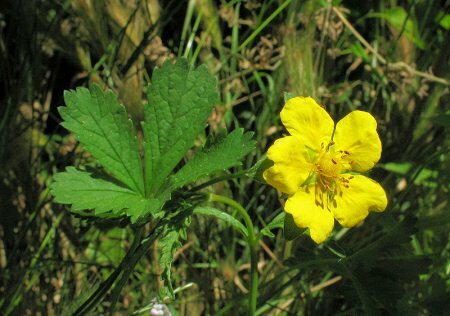 ﻿ Potentilla reptans (Creeping Cinquefoil) : MaltaWildPlants.com - the online Flora of the Maltese Islands. Perennial; stock relatively slender with a persistent rosette of leaves; flowering stems 30-100 cm, procumbent, rooting at the nodes, glabrous or pubescent. Leaves digitate; leaflets 5(-7), 5-70 × 3-25 mm, obovate or oblong-obovate, dentate or serrate-dentate. Flowers 5-merous, all solitary, axillary. Sepals and epicalyx-segments variable. Petals (7-)8-12 mm, up to twice as long as sepals. Stamens c. 20. Carpels 60-120. Style conical at base, enlarged at apex. Europe except the extreme north.